A UK site called Just The Flight has designed an infographic that lists many of the places inspired by fictional stories. 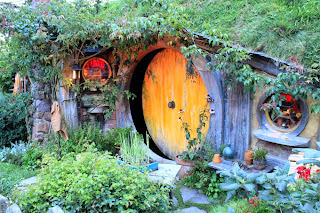 We found Hobbiton in Matamata, NZ, fascinating but that's only one of several places in NZ that were used for the Hobbit or Lord Of The Ring movies. There are so many more spots to visit for some of your other favorite stories. I've always been a fan of Superman. My voracious reading habit was fueled early by comic books. Wish I had known back then they'd be collectible. I could have financed a lot of travel with them. The list includes Smallville and points to Topeka, KS. Of course most equate NYC with Gotham City and Batman or with Metropolis for Superman. While we are on comics and animation, a fjord in Norway is said to have inspired Disney's Frozen. The popular Winnie The Pooh, by A.A. Milne, is said to have been inspired by Ashdown Forest in England. It is 30 miles south of London in the county of East Sussex. So if you're looking for a stroll through the Hundred Acre Wood, that would be the place to go. Jurassic Park or Lost fan? Travel to Hawaii for the places where those were filmed. Check it out. There are 50 locations noted for movies, books, even video games. Maybe it will inspire a travel adventure. A Walk In The Park. . .er, Zoo. A Wednesday Filled With Words! !